I seem to be on a family theme the last few blog posts, and yet, I have one more. My sisters and I take a “Sister Trip” every year and last weekend we went to Dallas for the Dallas Quilt Guild Quilt Show. They apparently have a big active membership because their show is the biggest guild show that I have ever attended. And they have it every year in early March. My own guild as well as several other Houston area guilds only do a show every other year. I have been on the quilt show committee and I can tell you that it takes a lot of planning and preparation. My sisters were quilt show virgins, so they were amazed at all the quilts and the vendors. They were most impressed when we walked up on the quilt with my name on it as the quilter, so they had to take a picture. This was in the Red Crinoline Quilts booth. I’ve quilted quite a few quilts for them through the years and it’s always nice to see their booth. 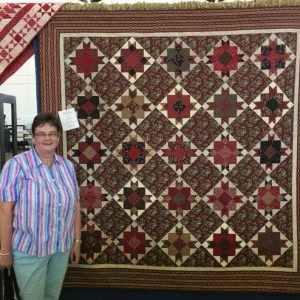 Paula Barnes designs the quilts and a lot of the fabric, Mary Ellen Robison pieces them and then they send them out to be quilted. My sisters and I spent most of Friday at the quilt show and then went back to the hotel and spread out our wares. We decided that we wanted to stay in our room on Saturday and cut and sew fabric all day. I had brought my sewing machine and cutting mat and all the necessary tools so that we could each take turns sewing, cutting fabric, and ironing our quilt blocks. My sisters started working on charity quilts for residents of a rehab place that the three of us and my mother have adopted. I worked on cutting fabric for a wedding quilt for my niece and sewed blocks for another Camp Hope quilt. I took some photos of my sisters sewing, but they seem to have vanished, but if I find them, I’ll share them in another post. We only left the room to walk across the street for lunch and then we had pizza delivered for supper. We’ve already planned next year’s trip and we’re going to take more sewing machines and get a bigger hotel room so we will have more space to spread out. And I’ll be sure to take more pictures and try not to lose them. I’m back home now working on all those graduation t-shirt quilts and my schedule is getting pretty full, so get your t-shirts to me as soon as possible.